Problem gambling is gambling behavior that causes disruptions in any major area of life: psychological, physical, social or vocational. The term “Problem Gambling” includes, but is not limited to, the condition known as “Pathological”, or “Compulsive” Gambling, a pregressive addiction characterized by increasing preoccupation with gambling, a need to bet more money more frequently, restlessness or irritability when attempting to stop, “chasing” losses, and loss of control manifested by continuation of the gambling behavior in spite of mounting, serious, negative consequences. The Indiana Council is an advocate and a resource for problem gamblers and their families as well as a source of information on problem gambling. 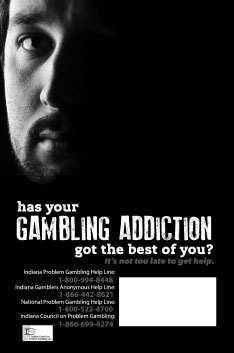 The Indiana Council’s web site exists to be a resource to those seeking information on problem gambling in Indiana.